← This Is Not Your Normal Post. 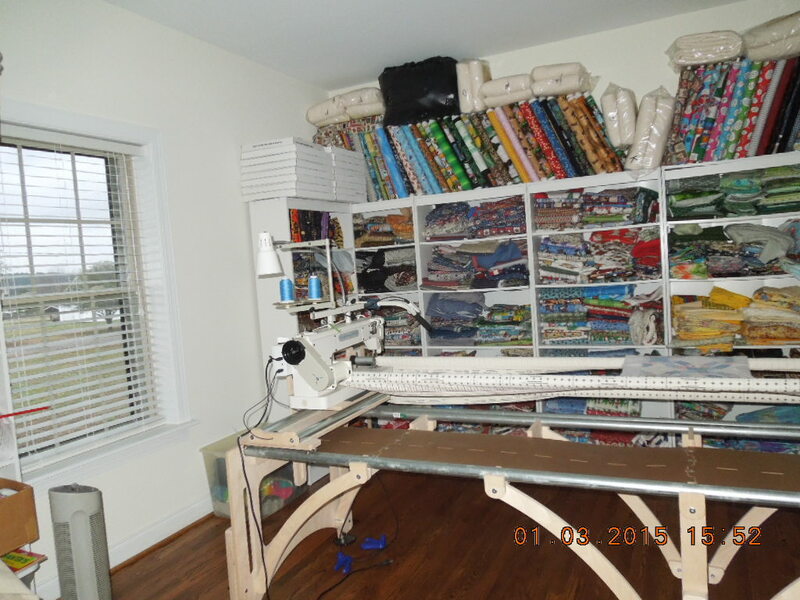 Cleaning Up My Sewing Studio To The Tune of 27 Days Of Feng Shui With Katie Rogers! I am taking a 27 Days of Feng Shui class with Katie Rogers. We are on day two. So far I am caught up. Tomorrow may be another story. I have gotten to know Katie over the last two years and I just adore her. She is such a nice lady, very knowledgeable and her goal for her life on this earth is to make ours more fulfilled , uncluttered and happy. It will be a life time work in progress to get to that point but hey all we have is time. Life is a journey and you may as well go the best route on the trip. Katie is showing me that route. All you have to do is listen to her and her instructions follow them and it is true, Feng Shui your life and you live a better way of life. I am not 100 percent there but I am working on it. Enjoying every mile. Ok to my original idea of the post and I got sidetracked. I find that I have a disorder I mean to write one thing and get totally off on another. Kind of like Edith Bunker did when she was trying to explain something. Went totally around the corner to tell you how to get across the street. Good name just came to mind. Edith Syndrome. 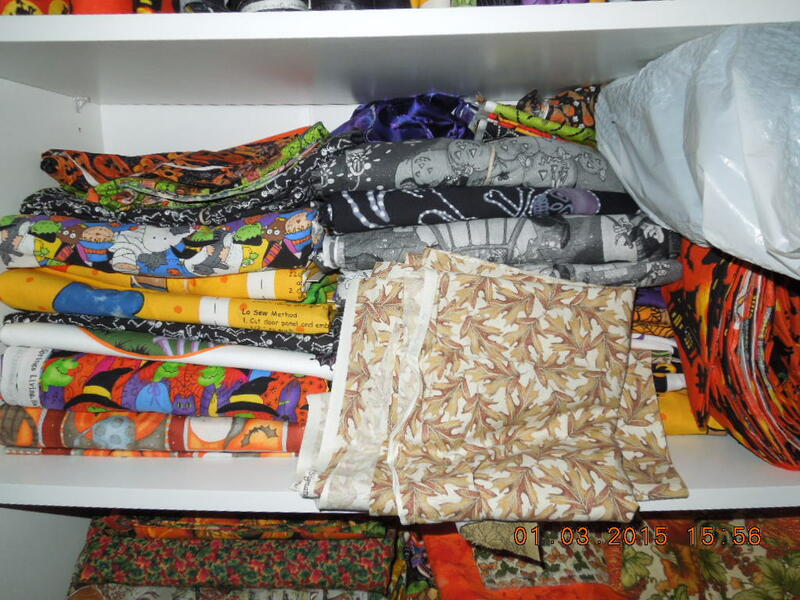 DAY TWO OF FENG SHUI I spent my five minutes which turned in to 2 hours organizing my long arm room and when you see it you are going to want me to stand up and say “I am Chris and I am a hoarder of fabric.” Well that is true and not true. 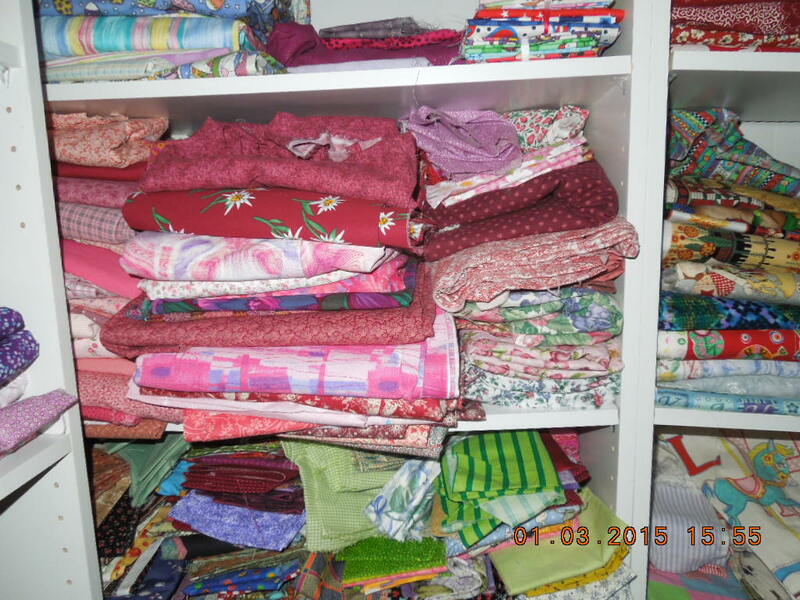 How it is true is I DO HAVE A TON OF FABRIC. I had to strike while the iron was hot. 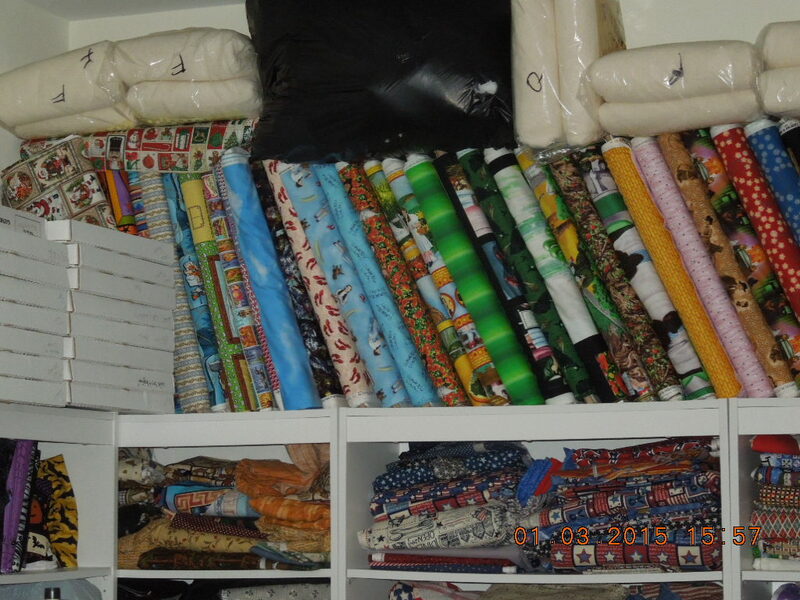 By that I mean I was at places at times when they were going out of the fabric business and I bought fabric that had been more then $5.00 a yard originally for twenty five cents. Yes a QUARTER.. $.25 . Now knowing over the years I was going to spend my golden years and yes I can not believe I even said that.. I always scream and kick and holler I am middle aged but I am going to continue to think that, but in all reality I am in the fourth quarter of the football game and I just called a time out and going to hold that time out for at least 50 more years. I used to ask the good Lord to let me live to see 100 and since that is only 39 years from now I am upping the number. Give me 110. 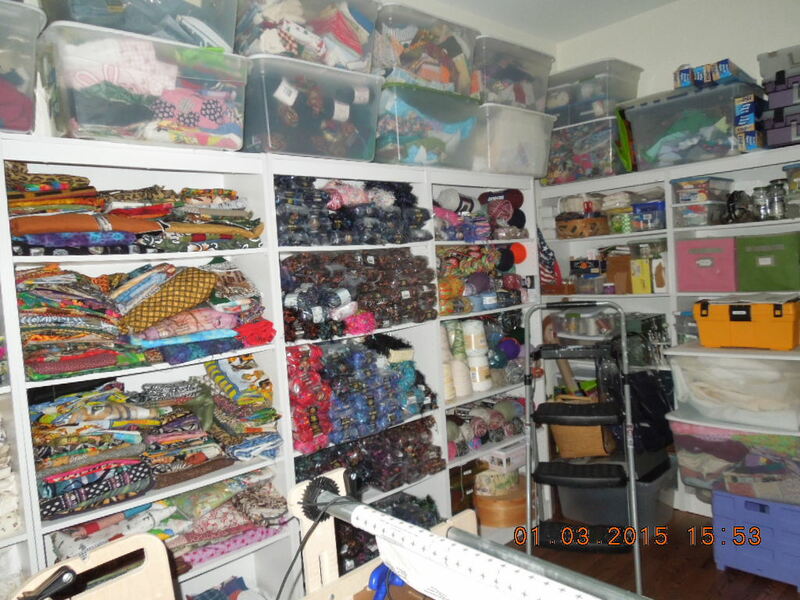 Today tackled the room where my long arm which is going to be another story and my fabric and supply stash is.. it was not really all that bad but it was bad enough it was getting on my nerves. The long arm is another story. Maybe tomorrow. I have such a great view while I am in here working on the long arm when I get unafraid of it. This will NEVER look perfectly uncluttered which it is not really cluttered. I do not really know what to do here to hide all this? 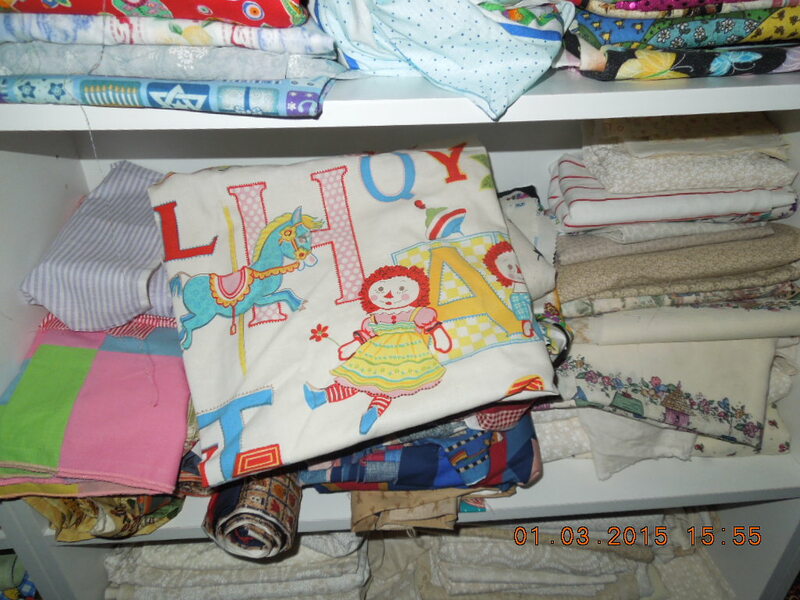 At one time at our previous home I hung up quilt tops that I was never going to use to make it not seen. Now they are in the bucket to practice on the long arm. I wonder if I took those metal grommet things and put them in fabric cut and hemmed to fit these cases it would look better. Suggestions please. You know that is an idea. I am going to have to think on this. I am so dang short I have to have a ladder in here to get items off the top shelf. I was carrying it a country mile across the house to the laundry room and I decided to leave it in here. I am tired of bruises on the legs. 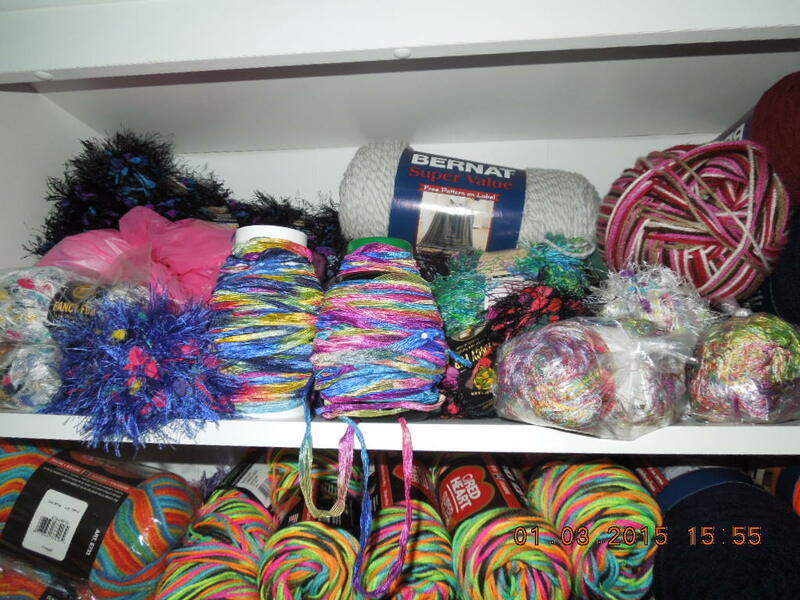 I guess get another glimpse of another addiction I have.. Knitting. 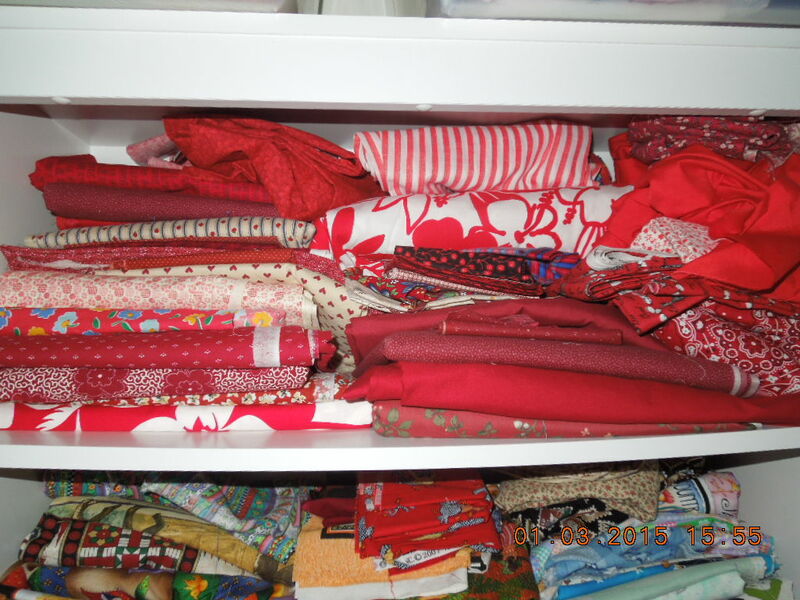 I love the way I have my fabric color coordinated to the best of my ability. Gary was kind enough and smart enough to stand up the bolts on the top so that we could get more up there and easier to remove when I need some of the fabric. MMM what can I say? 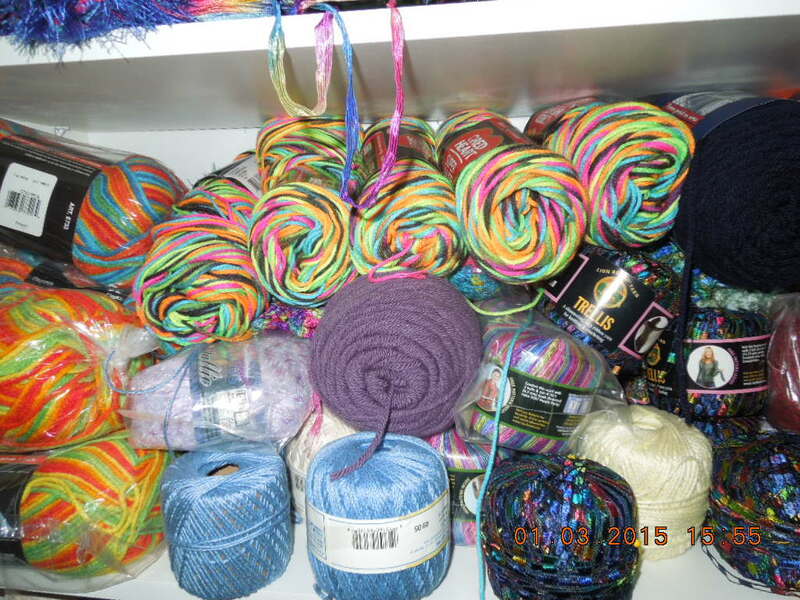 I love to knit. 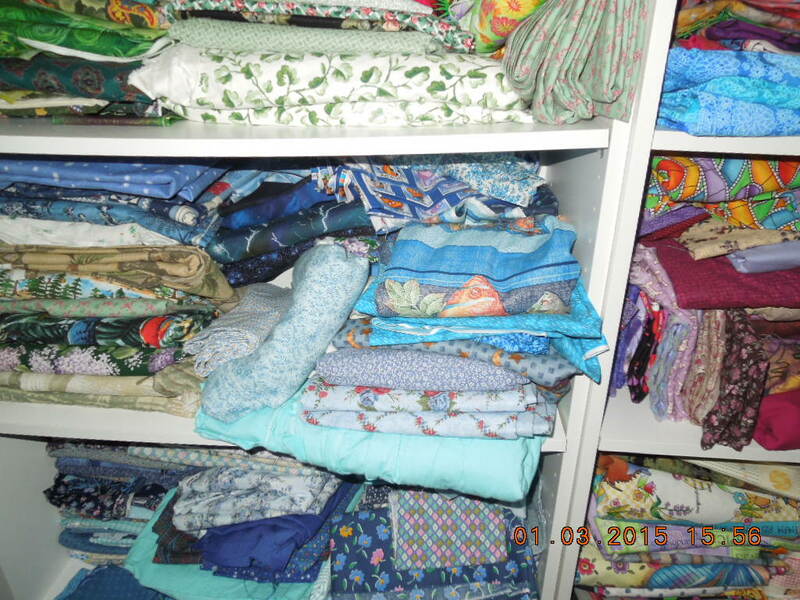 I have tried to keep my fabric color coordinated and themed. 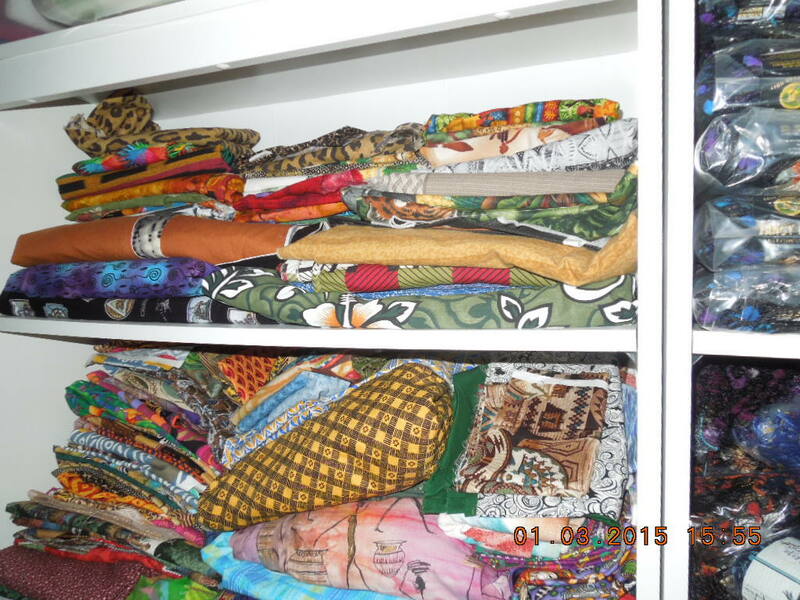 I am a big time lover of African fabrics. You can see here. I have some pieces you can not find anymore. I am thankful I stocked up when the getting was good as we say in the South. See how I try to keep all the same colors together? The color family? I am really becoming a lover of pink and this rose color. Confession time.. Shelf one and three where you see the peace fabric. I may have to go to therapy and let the therapist hold my hand while I cut anything off those two shelves. 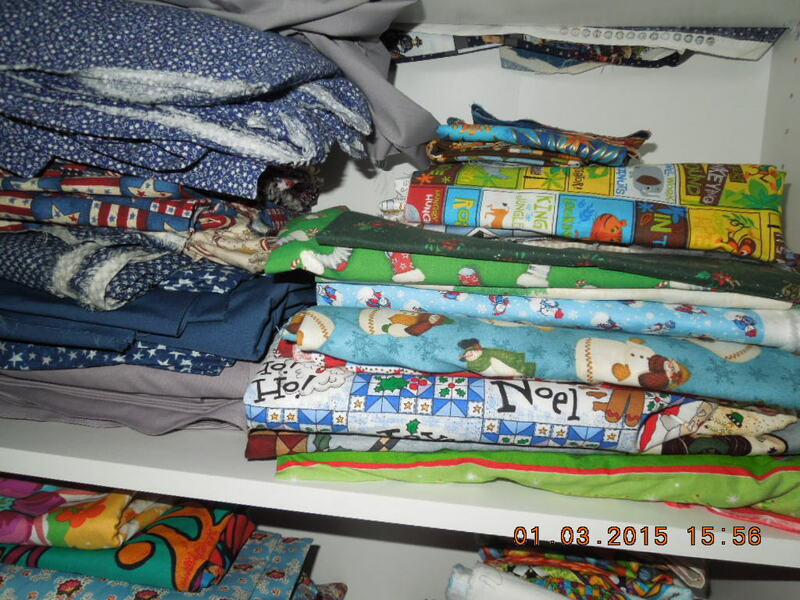 Do you all have fabric you just can not stand the thought of putting scissors to it? I do.. I need intervention. Some of my blues. I got the blues.. I love BB King.. See there goes the Edith Bunker Syndrome again. I see some football fabric. Well hello Maxine. If anyone needs any Maxine fabric these are practically full bolts. 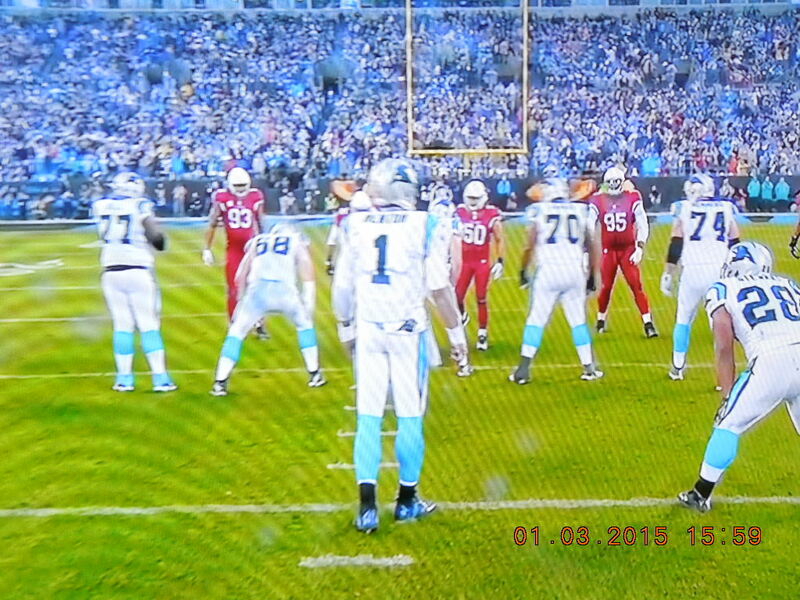 15 yards come on a bolt. Wizard of Oz. I have a ton of this. This will be really hard for me to let go of. 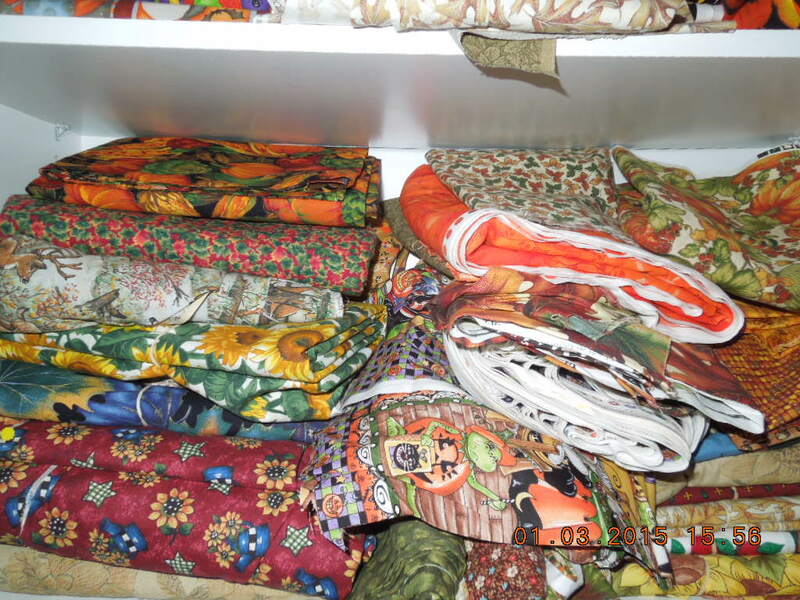 After I get a couple of quilts finished I may try to sell this fabric or some of it. 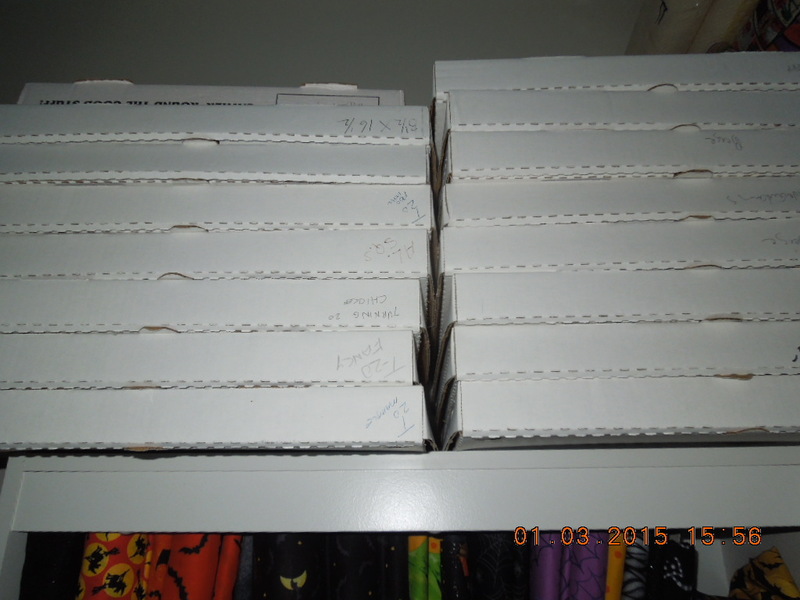 However you can not find it anymore unless you find someone that bought all the bolts of the collection or almost all like I did. 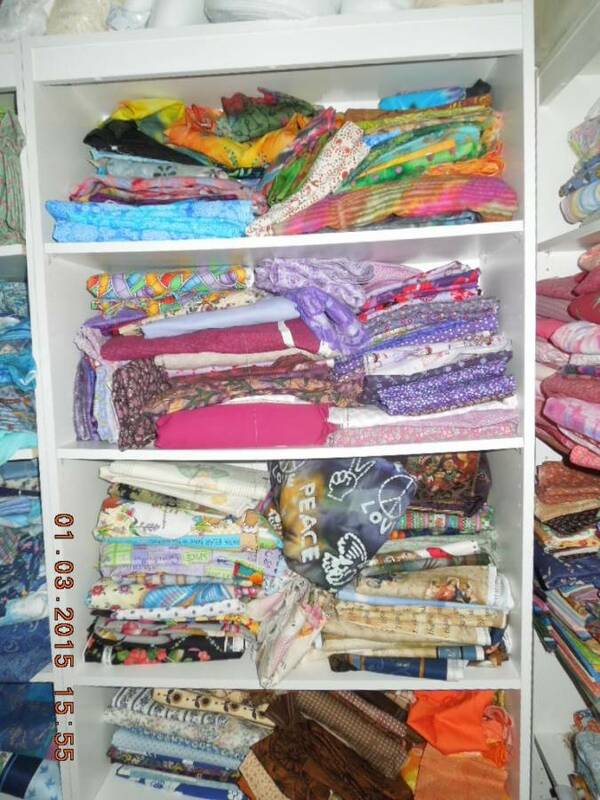 I told you I have a fabric fetish. Well not so much that I just get what I like before it is gone. 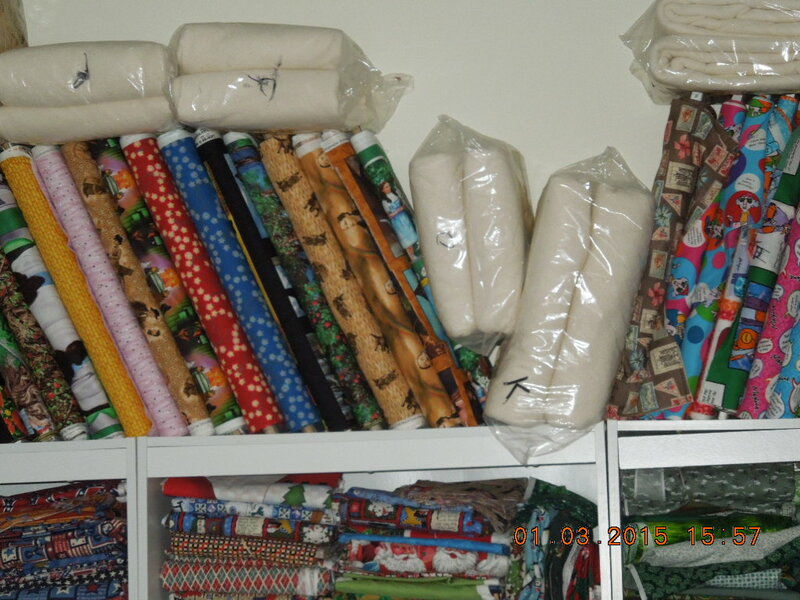 So many times I have wanted something in the fabric line and not gotten it only to have to spend all my time hunting for it later on and can’t find it. Pizza anyone? Take out or eat in.. Well these are pizza boxes but nothing has ever been in them nor is there any advertisement on the front of the box. I use them to store left over blocks and pieces.You can see on the boxes I have written what is in there and I see or I think some of the boxes are upside down. I’ll have to adjust that tomorrow. I can’t stand anything that is not the right side up. I have some more boxes over in storage at our previous home we have. I need to remind Deara to bring them over or remind me when I go over there to get them. 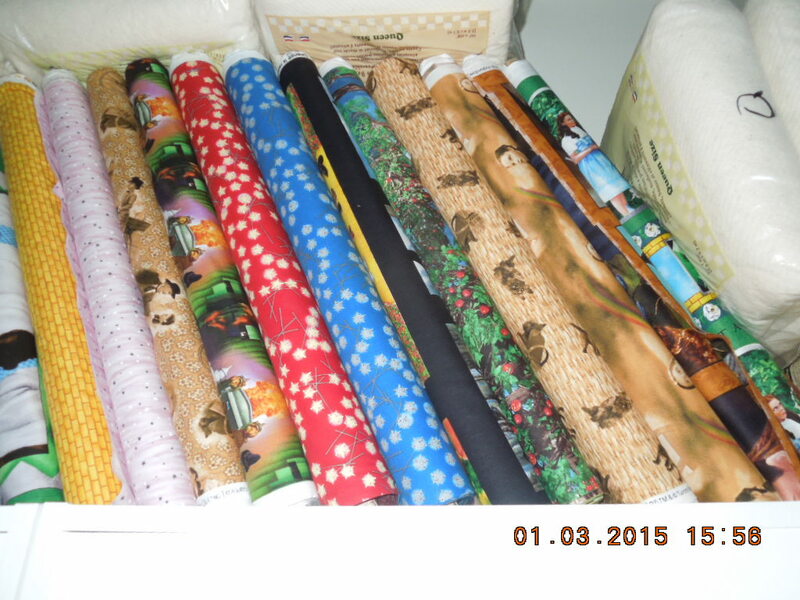 I can use them in my sewing area. BOOO BOOOO BOOO my sister and my favorite time of the year. Halloween. 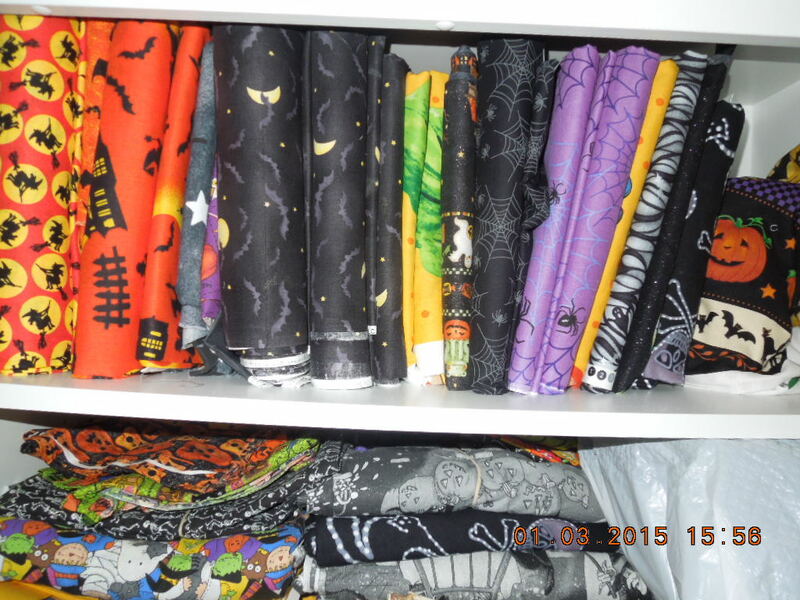 I have a lot of Halloween fabric.. AND SOME GLOWS IN THE DARKS…… WWWHHHHOOOO .. is that not scary???? Fall and some Halloween mixed. That is ok.. I’ll find it when I need it. 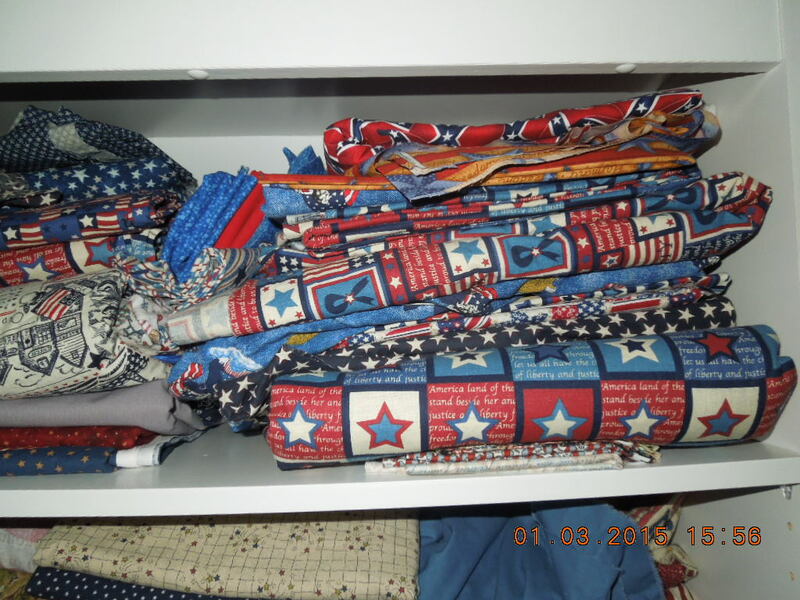 Three pictures of patriotic fabric. 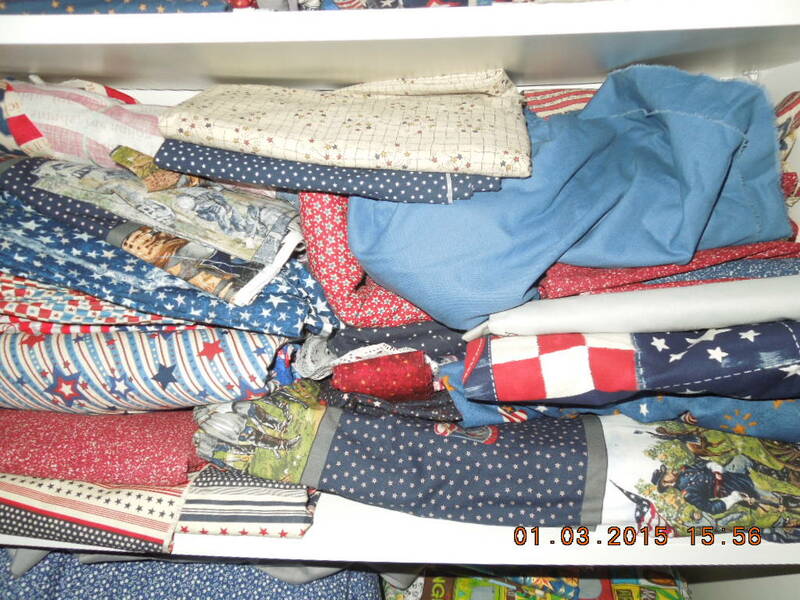 I am about to start on a quilt next week for a donation to a Vietnam Veterans meeting coming in June in Branson, MO. I will keep you posted on the pictures. I already have enough of the fabric and I am so in love with the pattern I am going to use.. I’ll be blogging a lot about it. Gary stacked the batting on top of the bolts. First that is a good idea for several reasons. 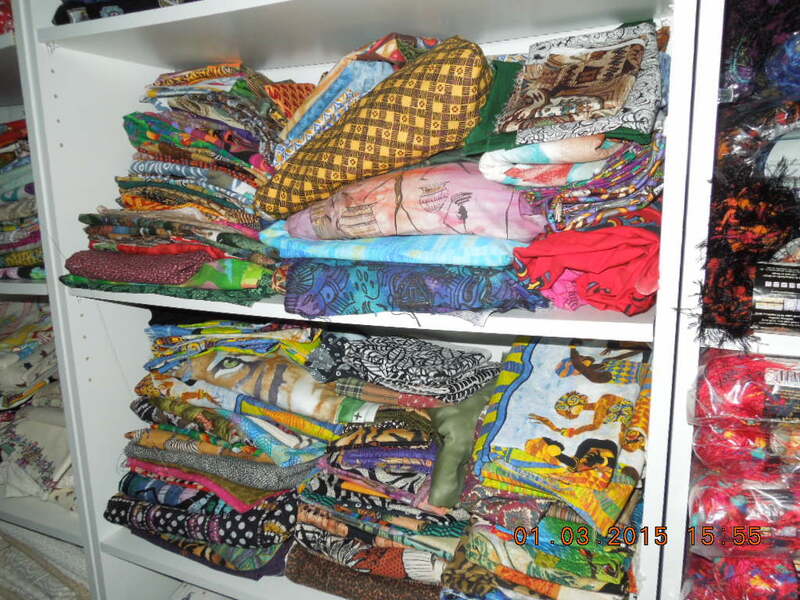 Get it out of the way does not take up space and helps keep dust off the fabric. I do not know what I would do without my Little Precious as I call him. He is a blessing. I made this quilt. I plan on having an old fashioned bed turning. 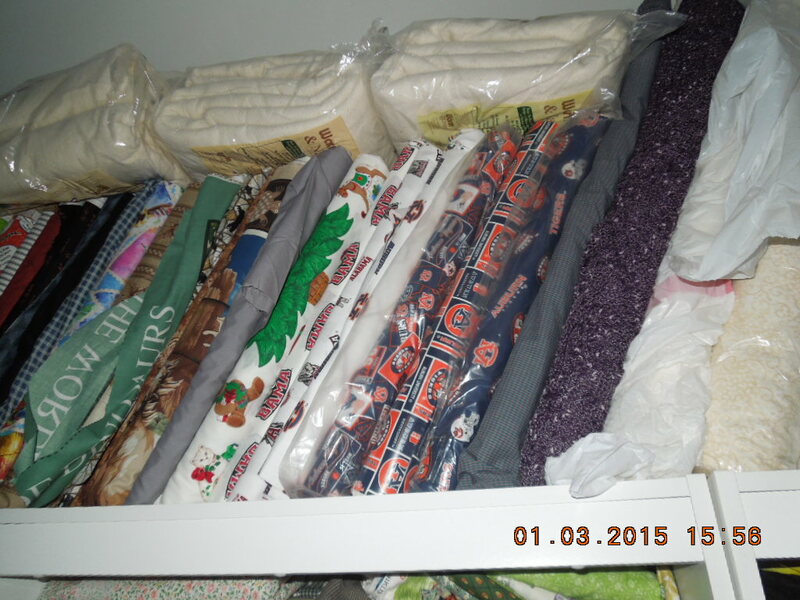 That is where the bed is stacked so heavy with one quilt on top of the other and they used to just flip them back to show them. I’ll stack them photograph them and put them online . 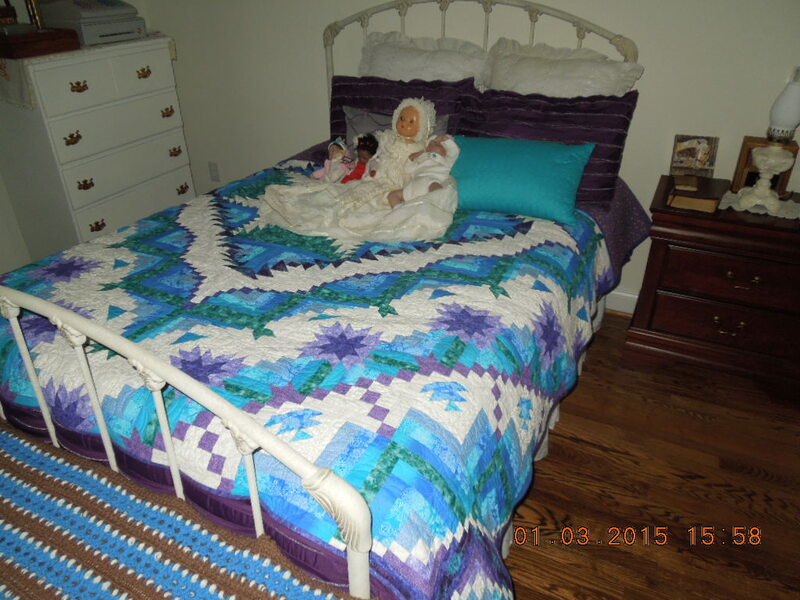 I have some quilts I want to put online to sell and I figure the best way to show them is put them on this bed and take pictures. Stayed tuned. Got to run. 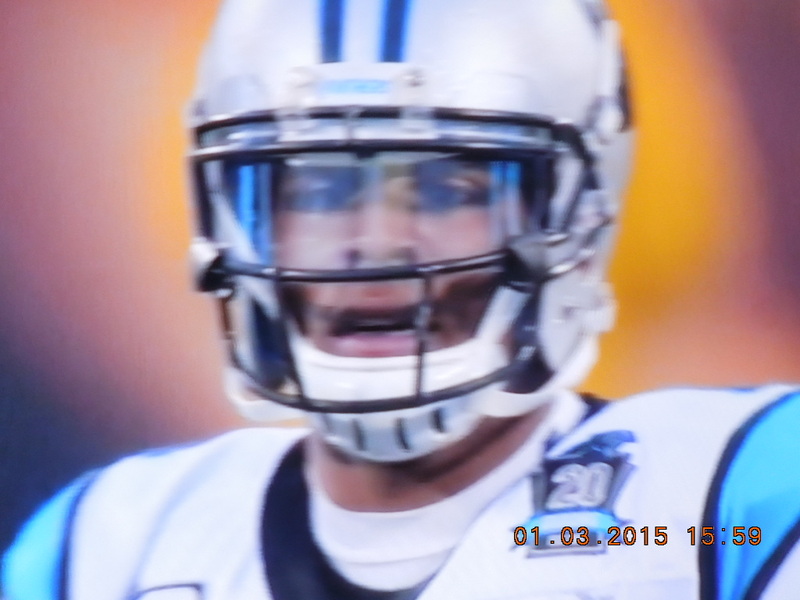 Games on.. My favorite player is on TV! 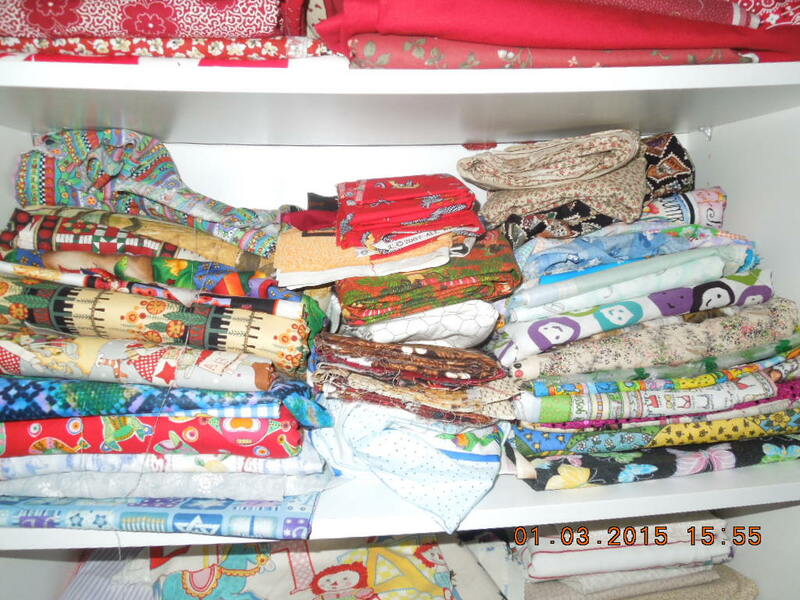 Stay tuned for more quilting adventures. BE SURE TO READ MY MESSAGE AT THE BOTTOM ***MESSAGE*** I in the past sometimes have been intimidated about posting. I never wanted to sound ignorant or put the wrong pronunciation or ….. I so so bad at doing… you know that thing.. Those line of periods…… But I have decided.. I am what I am, I am who I am.. I have a HS diploma and 6 months of college. That was 43 years ago. I have forgotten more than I have ever learned. I am not a professional writer nor do I claim to be one. I try my hardest to say and do what is proper but it “ain’t” going to happen and that word is not in my vocabulary I just put it here for special effects. I have a hard time with affects or effects until I got a formula to figure that one out. So I hope and pray you like my blog and if I get on your nerves with anything I say like some of my friends who say “IRREGARDLESS” that is equivalent to hearing teachers fingernails going across back and forth the black board.I have bit my tongue so badly it needs stitches but I love them so I say nothing to them because frankly they have not asked me to correct any of their vernacular. ( you were surprised I knew that word were you not?) Please feel free to correct me. My email is SadieMaesAttic@aol.com and you can put CORRECTIONS in the subject. I am learning. I have two special people in my life with tons of degrees. One has about 15 letters after their name and I always turn to this person and ask “do I say it this way or that way.” So please feel free to say to me what I should say or not say.. Until then.. EDITH SHUT UP! 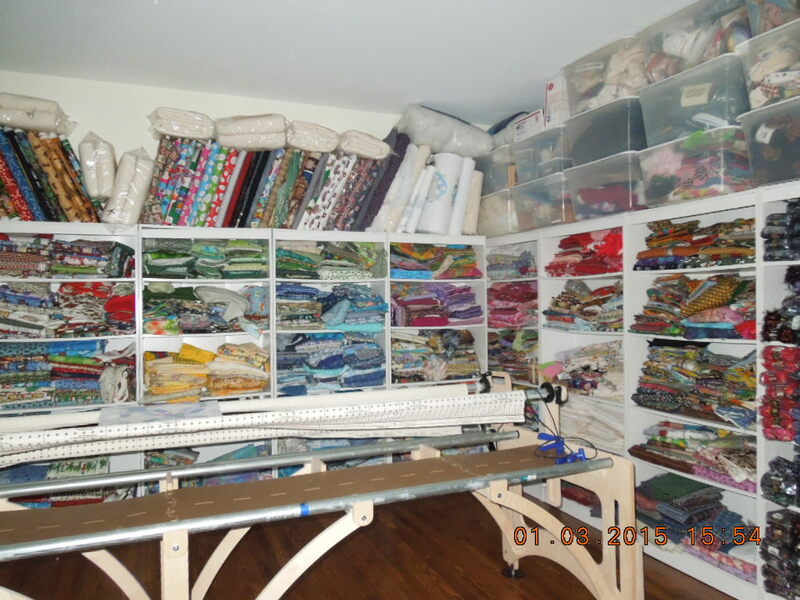 This entry was posted in 2015 New Posts, Feng Shui, Main, Sewing room progress. Bookmark the permalink. 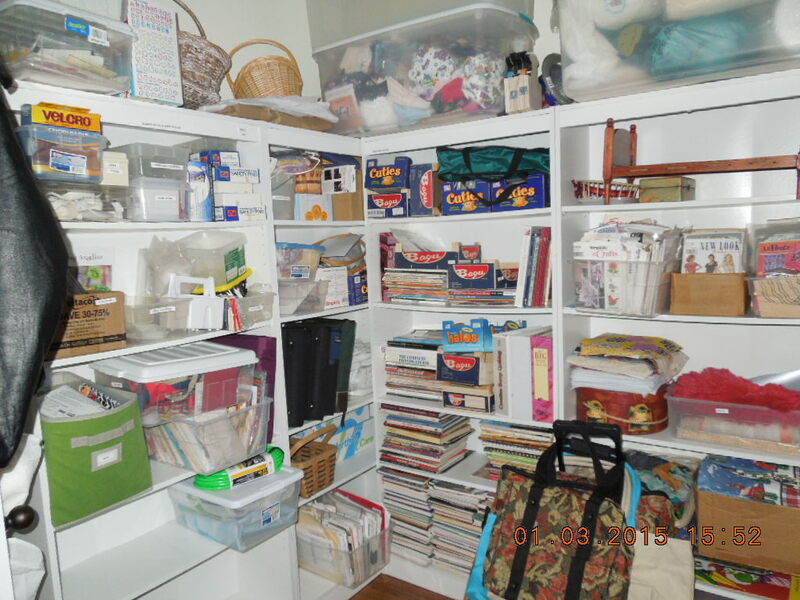 One Response to Cleaning Up My Sewing Studio To The Tune of 27 Days Of Feng Shui With Katie Rogers! 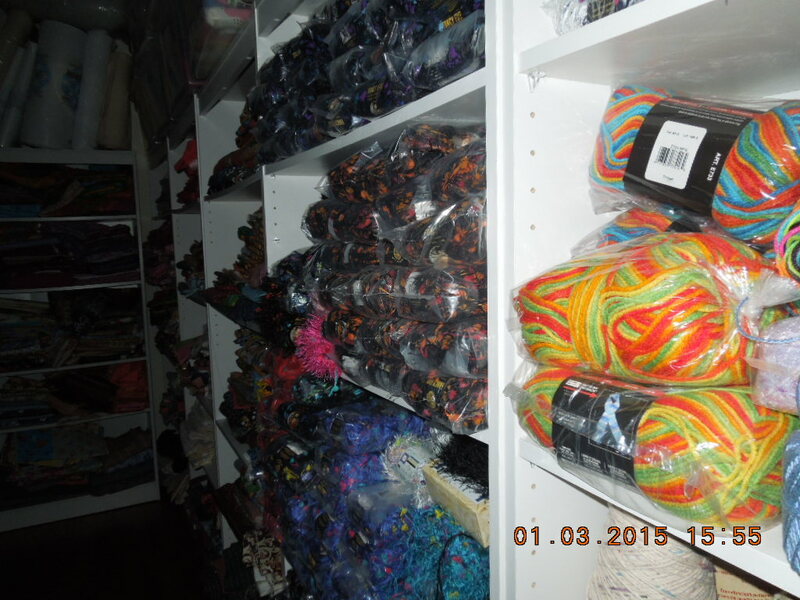 I’m trying to organize my sewing room, too. 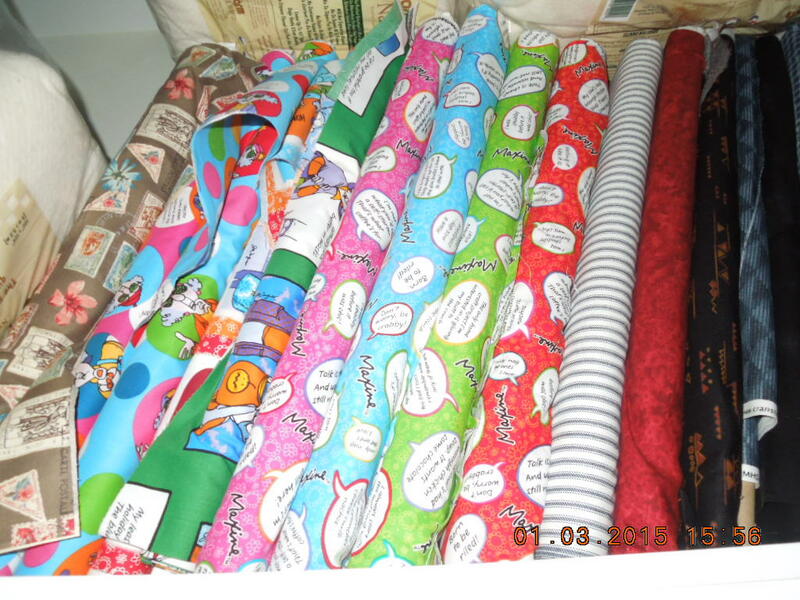 I’m folding fabrics (1 yd and larger) on comic book boards. 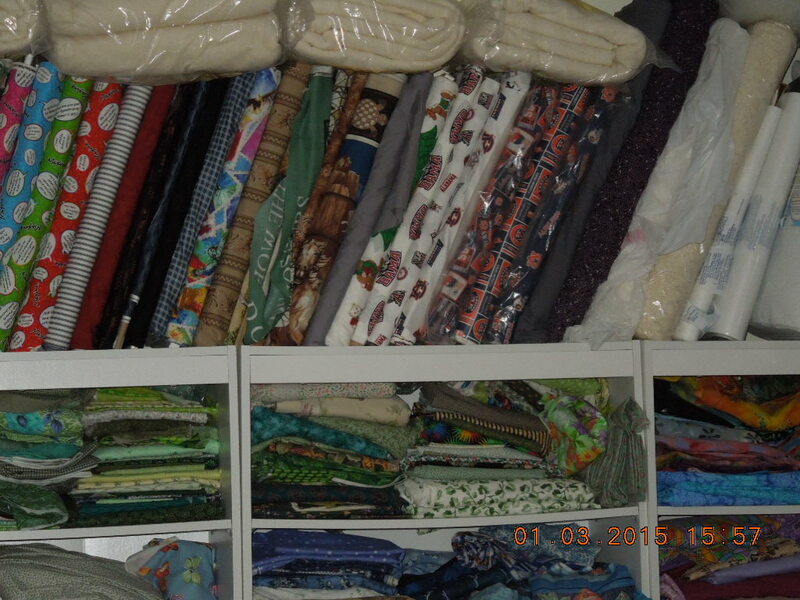 I’ve gone thru 300 boards so far, and, I have LOTS of plastic bins full of fabric in the basement. I’m running out of shelf space. 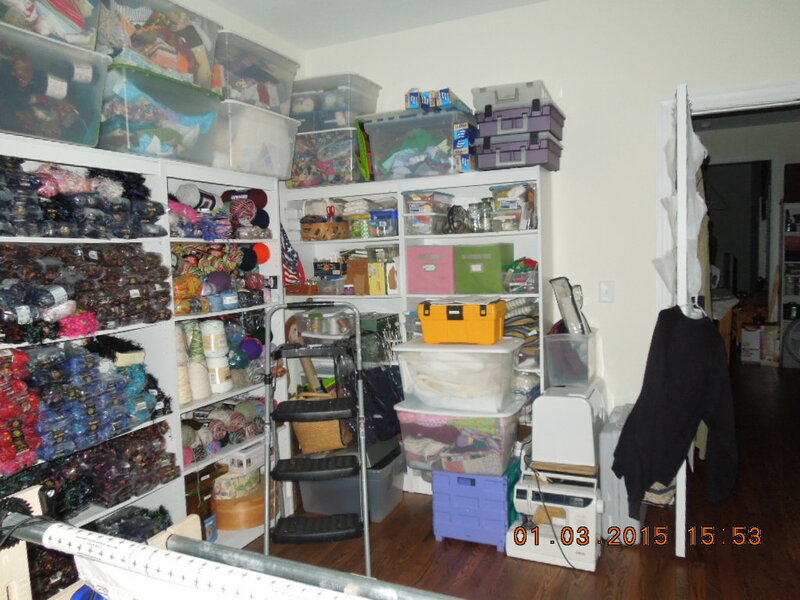 I’m planning on packing up everything in my son’s closet (I’m taking over his room, since he moved to AK), and I already have shelves, ready to assemble, that will line the walls of his walk in closet. Yipee! 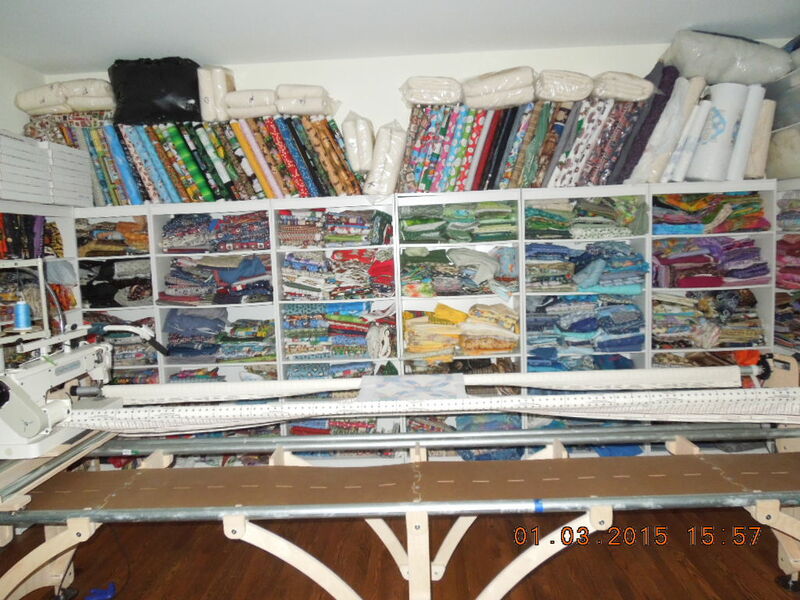 More room for some of the fabric still in the basement. 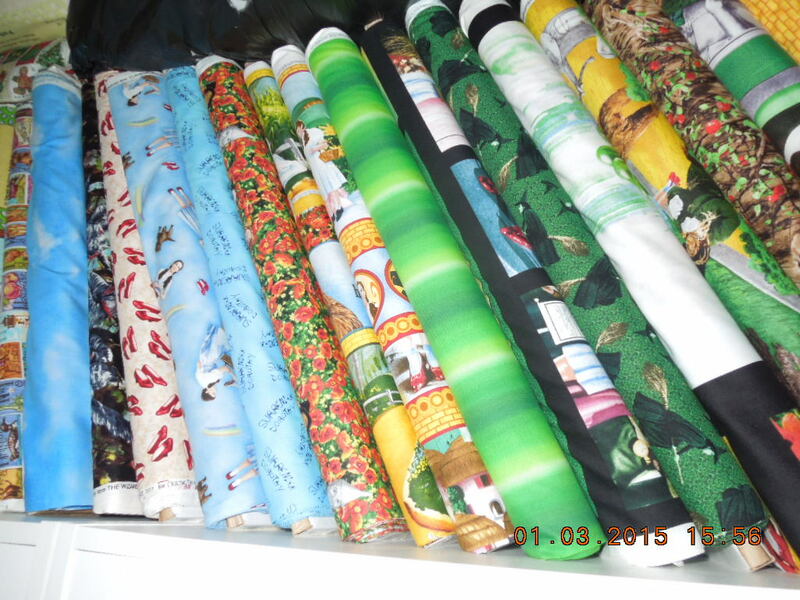 As for fabric, I hate to cut into any of my sewing themed fabrics, but, I was good this month, and made several things with some of it. Most of the things aren’t even for me. Cheryl´s last blog post ..A Great Gift!